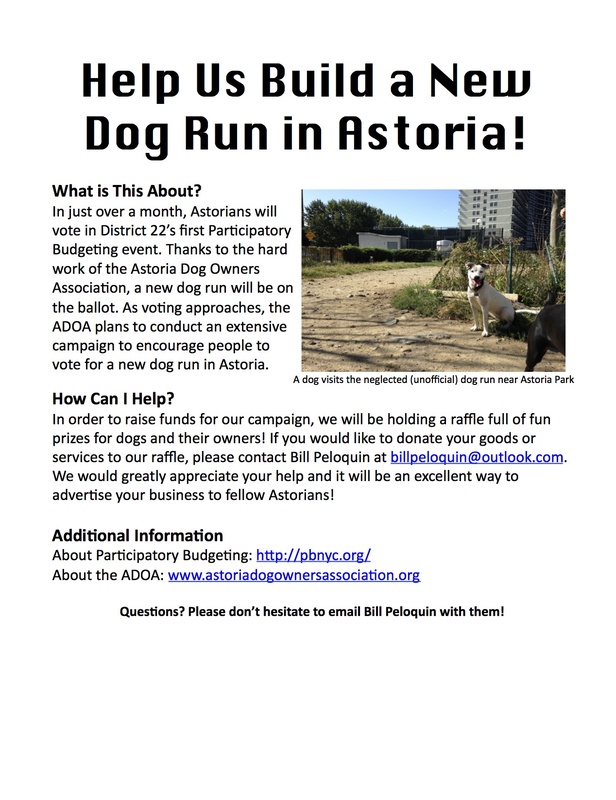 We are very excited to announce that we received the outcome of the Participatory Budgeting vote last night, and we have won the funding to build a dog run in Astoria! It has been a years long fight that we joined last year, and it is finally our time. 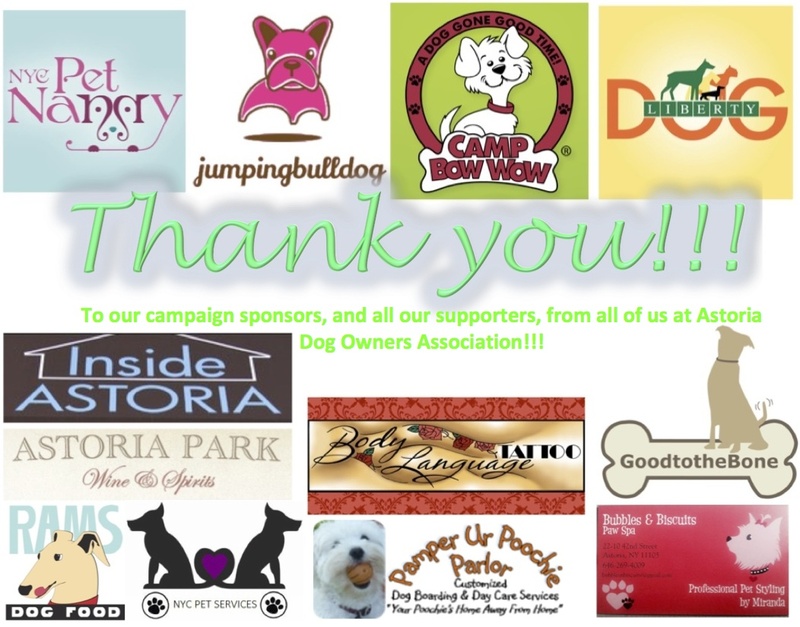 Thank you to all of our campaign sponsors, to our supporters, and to those who got out and voted for Proposal 13. We wouldn’t have been able to make this happen without you. Please forgive us while we take the time to update our webpage, and while we figure out what the next steps are in the process towards getting the run built. We will continue to keep you all posted as we get more information. You can find the latest updates on Facebook, as well as here on our blog (as we take the time to reorganize our webpage and publish the latest information). And, thank you again. This is a reality because of all of your help!!! 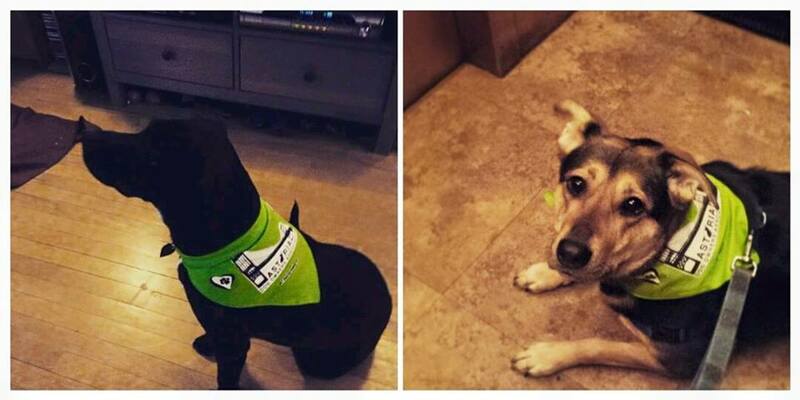 Basil and Delilah are ready for our campaign! Prize 1: from The Jumping Bulldog – Grooming certificate, 1 night of boarding, 2 days of daycare, holistic US treats, a chew toy, and a grooming product. from Astoria Pet Photography – 1 small dog portrait session. Prize 2: from Good to the Bone – (1) 1 hour private training session. Prize 3: from Camp Bow Wow – 5 days of doggy daycare Prize 4: from Astoria Park Wine & Spirits – $100 gift certificate Prize 5: from Inside Astoria – $100 gift certificate Prize 6: from Dog Liberty – 1 training session Prize 7: from Dog Liberty – 1 training session Prize 8: from Body Language Tattoo – $25 off coupon from Rams Dog Food – 3 containers of dog food. Prize 9: from NYC Pet Services– 2 nights of boarding, 2 days of daycare, 2 walks [Astoria area only], 1 bath Prize 10 [x3]: from Bubbles & Biscuits Paw Spa – 1 full grooming service & 1 day of daycare Prizes 11 [x2]: from Bubbles & Biscuits Paw Spa – 1 full grooming service Thank you to all these amazing local businesses for their support!!! As we recently announced, our proposal for a new dog run in Triboro C has been approved and will be on the Participatory Budgeting ballot this year. In preparation, we will be campaigning in support of our initiative, in hopes of getting enough votes to have our project funded! We have a lot of work to do, since the voting period is only a month away. In preparation, we will be fundraising as well as working towards developing campaign strategies. We are looking for volunteers to help us get information about the voting process and our project our to Astorians in City Council District 22. Campaigning will take place leading up to voting in April (the 12th to the 18th), and the more people who can help, the better. A lot is riding on this vote; if we win, we receive the funding for our project. Since we already have Community Board 1’s approval, as well as broad community support, there is less red tape. We would be able to move forward with getting bids for the building of the park, and hopefully, building the park sooner than later. If we do not win the vote, we will have to find finding elsewhere. In order to fund our campaign (including paying for fliers, t-shirts, bandanas for our pups, etc. ), we are also planning a raffle, with lots of fun prizes for us and our pups. Any leftover funds will go towards funding the run itself. If you are a local business owner, and interested in donating goods or services to our organization to raffle off, please contact us (you can email our chairman at billpeloquin@outlook.com or use our contact page to get in touch with us​). It is a great way to help the community and an advertising opportunity for your business/organization. You can download our raffle flier here: RaffleHandout. Our next meeting will be held on Tuesday March 10th, at 7pm. As usual, the meeting will be held at Shore Towers Condominium. At this time, we will be discussing fundraising (including our raffle), our PB campaign, and other matters related to the building of a dog run. As always, our meetings are open to the public. All are welcome! If you are interested in volunteering to help with our campaign, please attend! You can see event details and RSVP (not that we require it) here. Minutes from our last meeting are available on our Meetings page. You can also contact us for more information, or find us on Facebook (we manage a Page or you can join our Group).